Some retailers make up for their low-cost prices by adding extortionate delivery charges on to your order, but not Gardening Express. Gardening Express provides free delivery on all orders, allowing you to save money every time you shop. If you're looking for discounts on flowers, plants or garden accessories then check out the special deals section where there's up to £25 off selected garden items. Where do I use my Gardening Express voucher code? Gardening Express is the leading online garden nursery with a plant selection that is second to none. In their plant catalogue you can choose from a vast selection of garden plants including Perennials, shrubs, climbers, trees, grasses, ferns, bamboos, bulbs, fruit, hedging, Mediterranean plants, bedding plants, roses and more. Whether you’re shopping for vines, conifers, vegetables, house and office plants, ornamental grasses, tropical and exotic plants, dahlias, bonsais or flower gifts you can find them all for an affordable price at Gardening Express. As well as huge variety of plants, Gardening Express also offer bundle packs allowing you to fill your garden with an abundance of colour and foliage and gift cards; the perfect presents for a fellow garden lover who’d like to buy themselves some new plants. If you’re shopping on a budget you can also check out the special deals section where there’s tons of great deals and discounts on a variety of plants and flowers. Gardening Express has an environmental policy that ensures they minimise any potential impact their operations may have on our planet. From simple procedures like ensuring computers are not left on standby; wasting electricity overnight, to careful consideration of the amount of packaging and water used in their nurseries: all aspects are covered. All of Gardening Express’ packaging is made from 100% recycled materials and is infinitely recyclable, they also use 100% peat-free composts and keep all kinds of wildlife in their local vicinity from bats to buzzards, owls to otters and toads to terrestrial orchids. All these components make up Gardening Express’ environmental policy that they strive to continually review, ensuring that they always sustain their high levels of commitment to the environment and all the creatures on it. In recent years bamboo plants have become an extremely fashionable plant for many garden settings. Gardening Express know this and therefore offer multiple varieties that are both easy to grow and fully hardy. These varieties don't get too large for the average garden and are equally suitable for growing in containers as well as the open ground. If you want to grow a largely sized bamboo plant place it in open ground and leave unpruned, however, if you want to maintain a smaller size plant make sure you prune it in early spring. A great thing about bamboo plants is that they’re evergreen; offering attractive, lush foliage that can be used to add a tropical effect to any garden all year round. If you have an oriental style garden, bamboo plants are an ideal component to use, creating an exotic feel that’s synonymous with the stunning natural scenery from Southeast Asia and Africa. House and office plants are a great way to make your interior surroundings more attractive and colourful and many scientific studies have proven they are also positive for your health. Houseplants can promote feelings of well being and help remove pollutants from the air, perfect for keeping you motivated and positive. Large or small, every home or office should have a few plants and Gardening Express have a selection of easy care, popular varieties for you to choose from, all of which are delivered to your door in high-quality condition, ready for display. Shop from cacti, succulents, carnivores, orchids and many more indoor plants and enjoy a stunning display of nature both in your garden and your home. If you are not completely satisfied with your purchase, simply return the item or items to Gardening Express in their original condition within 14 days of receipt. Please the contact form to contact Gardening Express. Founded in the late 1990s, Gardening Express has years of experience and is now the leading online garden nursery supplying a huge catalogue of plants including bamboo plants, ferns, roses, shrubs, trees, Delilah's, bonsais, patio plants and much more. 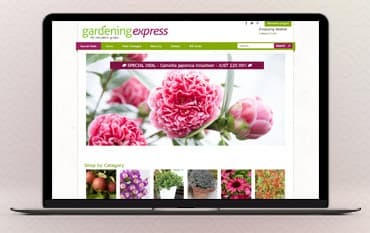 Shop online with a Gardening Express discount code from us and you could save yourself a fortune on all your bulbs, hanging baskets, flowers and plants. And with a five-year guarantee and a 100% price promise, you can rest assured that you’re buying from a top company who you can trust.